The guest commentary below was written by Christopher Whalen on The Institutional Risk Analyst. In his new book, “Keeping At It: The Quest for Sound Money and Good Government,” by Paul Volcker (1979-1987) with Christine Harper, the former Fed Chairman delivers a sound rebuke to Chairmen Ben Bernanke (2006-2014) and Janet Yellen (2014-2018), and other Fed governors and economists, for fretting overmuch about deflation. He argues that the true danger is that loose monetary policy leads to inflation and market contagion caused by the manipulation of risk preferences. 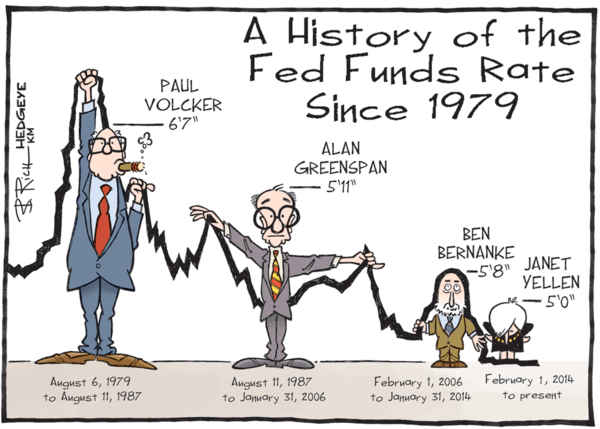 Of course, Volcker is cut from different cloth than his successors. Janet Yellen was only chairman of the Federal Reserve Board for four years and with good reason. She was arguably the most dovish Fed Chairmen in the history of the central bank, with a strong tendency to do too much rather than too little. Yellen confessed to the Financial Times last week that “I really thought we needed to pull every rabbit out of the hat.” And she did. The Federal Open Market Committee (FOMC) under Bernanke and Yellen also engaged in a deliberate manipulation of the term structure of interest rates via “Operation Twist,” a terrible mistake that has yet to be reversed. Operation twist caused untold damage to the financial markets and the US economy – damage that is still in process. Former Chairman Alan Greenspan, the most politically astute Fed chief in half a century, puts such worries in perspective: "I don't know a single President, and I worked for a lot of them, who don't want lower interest rates. Now, obviously that's not possible. You keep lowering them down to zero, where do you go from there?" Like Yellen, many observers worry that criticism of the Fed will make it difficult for the central bank to act when necessary. The dual, conflicted political mandate of full employment and price stability created by the Humphrey Hawkins law is not possible to achieve in practice, thus the FOMC lurches from one extreme to the other, causing enormous collateral damage. Consider the effects of QE and Operation Twist on housing. Think about the thousands of people in the mortgage industry, for example, that have lost their livelihoods because the boom and bust policies followed by the Fed since 2008 and even before. Think about the millions of American families today that cannot afford to buy a home because asset prices have skyrocketed over the past five years. When people talk about “Fed independence,” our response is independence from what? Presidents going back to FDR have tried, unsuccessfully, to bend the central bank to the political circumstances of the day. In the book Inflated: How Money and Debt Built the American Dream, we wrote about how Chairman Thomas McCabe (1948-1951) and his colleagues on the FOMC starred down President Harry Truman on the eve of the Korean War. He won back the Fed’s independence from the Treasury. But the Fed and Treasury, like all federal agencies, are notional institutions, merely alter egos for the United States. The greatest threat to the central bank’s existence is the tendency of Fed governors and economists to pursue abstract economic theories that make no sense in real world terms and often do more harm than good. We have written at length about how the radical policies followed by the FOMC, first under Bernanke and then Yellen, have distorted asset allocations, and the term structure of interest rates and credit spreads. For example, our best guess is that the 10-year Treasury bond, in the absence of QE2-3 and Operation Twist, should be yielding well-over 4 percent today. Instead this important benchmark of risk is barely over three percent. Indeed, the entire Treasury yield curve still shows a strong tendency to fall thanks to debt purchases by the Fed and other central banks. And corporate credit spreads remain compressed, with high-yield spreads up 25bps in the past month but really unchanged from a year ago, as shown in the chart below. Traditionally, Fed chairmen have disappeared into the world of academia, speaking or consulting after leaving office. Bernanke has followed this rule, but Yellen seems unconstrained by such conventions. During her discussion with the FT, Yellen worries about lending to heavily indebted, less creditworthy corporate borrowers, which she sees as a source of potential “systemic risk.” She also talks about the need for more regulation, to counter the potential for systemic risk caused by this accumulation of risk. Is it really possible that Chair Yellen fails to understand that the Fed’s deliberate manipulation of the credit markets since 2008 made this worrisome accumulation of corporate junk debt possible? Does she understand why most corporate debt issuers are clustered around the “lower bound” of investment grade ("BBB")? As we noted this past week, liquidity in the credit sector is the next risk on the merry-go-round of financial markets, a cycle of asset and market risk that the Fed largely controls. Today the FOMC under Chairman Jay Powell is working to “normalize” policy, but without unwinding QE2-3 and Operation twist. Last week, at a talk at the Peterson Institute for International Economics, newly confirmed Fed Vice Chairman Richard Clarida discussed monetary policy normalization, but significantly made no mention of ending other legacies of "unconventional" policy such as QE 2-3 and Operation Twist, or paying above-market interest rates on excess bank reserves. In the language of the FOMC, QE and Operation Twist were a form of stimulus. In the language of the financial markets, they represented a back door loan to the Treasury and the manipulation of credit markets. Even in the supposedly conventional world of Fed monetary policy, the concepts and indicators used to formulate public policy are often vague – a point that has already drawn the critical notice of Chairman Powell. Chairman Volcker is not the first member of the Federal Reserve System to criticize the dangerous policy drift inside the US central bank, but his comments are entirely on point. By substituting nonsensical concepts like “neutral” interest rates for hard data, and by manipulating the financial markets so that they are no longer reliable measures of risk or inflation, the FOMC under Bernanke and Yellen has been deliberately flying blind. So far, Chairman Powell and his colleagues on the FOMC have refused to speak publicly about unwinding QE 2-3 and Operation Twist. Meanwhile, former Fed Chairs Bernanke and Yellen travel the globe, congratulating themselves for saving the world from the threat of deflation even while encouraging the accumulation of the biggest pile of debt in modern history. But the full aftermath of the 2008 crisis is still incomplete. As and when the wheels come off the proverbial cart in the credit markets around 12-18 months out, it will not be due to a lack of regulation but rather because of reckless polices of the FOMC under the past two Fed chairmen. As Jim Grant noted recently, Chairman Powell truly is a prisoner of history.